This Simplicity® Limited Edition sewing and embroidery machine is simply unique! With a total of 336 embroidery designs, 136 built-in and 200 on CD, you are bound to transform your clothing into unique pieces of art. The 5" by 7" embroidery frame give you plenty of room to embellish anything from home décor items to your favorite jeans. Try personalizing your finished projects by applying classic monograms or applique designs with the included BES® Embroidery Lettering Software 2. Features such as advanced needle threading system, automatic thread trimming system and adjustable machine speed allows for an easy and effortless experience. 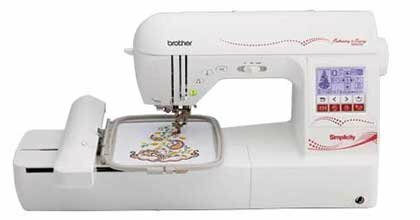 The SB8000 Sewing & Embroidery machine is simply unique! LCD Size (Horizontal x Vertical) inches 3" x 1.6"
Work Space (Height & Width) inches 4.1" x 7.4"
Machine Dimensions (H x W x D) 13.43" x 23.19" x 11.54"
Shipping Dimensions (H x W x D) 19.57" x 20.08" x 22.44"
Needle Plate Measurements 3.03" x 1.83"